Forums - Bricks in Motion » Contests & Festivals » THAC XVI - Coming January 2019! Topic: THAC XVI - Coming January 2019! Thanks to Nathan Wells for handing over the Twenty-four Hour Animation Contest to me this year. 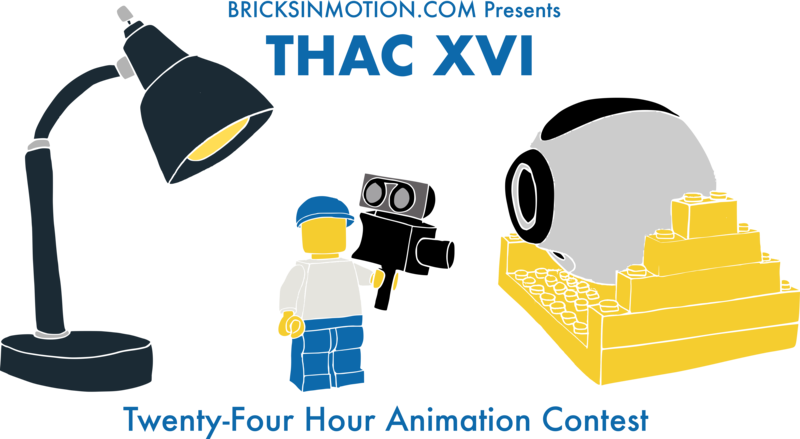 THAC is a brickfilming competition that lasts for exactly 24 hours. All writing, recording, animating, and editing must be done within the time limit. It’s a challenge but it’s a lot of fun! Anyone who is a registered Bricks in Motion member and is in good standing before the start of the contest can enter. Judges may also participate but will not be ranked or considered for prizes. Joint productions are allowed but it is up to you to divide the prize amongst yourselves if you win anything. Your entry must be entirely made during the 24-hour period. To prove this and as a long-time tradition of the contest, mod elements must appear in every shot of your film (see the new mod element rule listed below). Your entry must consist of primarily LEGO (or similar building block toy) stop motion animation. Live action, CGI, and hand drawn animation are allowed but stop motion must be the primary focus. Your entry must consist of at least 30 seconds of stop motion animation. There is no maximum time limit. No mature or explicit content is allowed. This includes but is not limited to: swearing, excessive gore, overt sexual content, and blatant drug references. You may not make your entry public until after the deadline. The entry you make public must be the entry you submit to the judges. You cannot create a version of your film that includes the mod element to send to the judges and then release a second version of the film with the mod element removed. Once the judging process is over however, you can make any changes you wish. Use of copyrighted material (such as music) is allowed, though be aware of copyright infringement. Use of copyrighted material will not affect the judging of your entry. Due to time restraints of the contest, music may be created before the contest. While using copyrighted/trademarked material is allowed, you are discouraged from basing your entry on pre-existing franchises such as Star Wars, Marvel, etc. There is no direct score deduction, but a film that uses pre-existing intellectual properties will not be viewed as favorable as a film that creates something entirely new. To prevent cheating, a theme will be announced at the start of the contest. You can brainstorm ideas beforehand, but there is no guarantee that your ideas will match the theme. The theme will either be a single word or a phrase. In addition, “mod elements” must be present in every shot of your film. A mod element is a visual component that must be physically included in each shot of your film to prove that it was made in the 24 hour timeframe. There will be two mod elements to choose from–you do not need to use both, you can pick one or the other, or even mix and match them if you like. As with the theme, these mod elements will be announced at the start of the contest. The first mod element is a color mod. This will be a combination of two random bricks that must be connected together or touching. (For example, a green brick connected to a white brick.) The second mod element is a letter mod. This could be any one of the 26 letters in the English alphabet. You may use upper or lowercase versions of the letter, but the letter must be recognizable. There is a new exception to the mod element rule this year. Please see the first bullet point directly below. MOD ELEMENT UPDATE FOR THIS YEAR'S CONTEST: In collaboration with the Bricks in Motion staff, we have decided to allow for 15 seconds of leeway with the use of the mod elements. For THAC XVI, you do not have to include ANY mod element for a maximum of 15 seconds of animation. When you have reached 15 seconds, you must then include the mod element in every shot. The 15 seconds can appear anywhere in your film and do not have to be in order. This will allow you to film shots where the mod element is difficult to incorporate. Additionally, we do not want to disqualify an entry for accidentally forgetting the mod element in a few shots. The letter mod may be upper or lowercase. The letter can be rotated but not mirrored. It must be clearly identifiable as the particular letter. It may be written on a piece of paper or sticker, drawn directly onto a brick, printed onto a piece, or built from pieces and even integrated into the set. The letter mod may exist as a printed LEGO piece, but it must clearly be that letter. Expressions on a minifigure face or folds in clothing on minifigure torsos are not letters. Mod elements must be physically present. They cannot be digitally added in post production. Minifigure parts such as a green torso attached to white legs do count as the color mod. However, bricks connected to or touching a baseplate do not. You do not need to include the mod elements in the title or credits. Entries will be judged on criteria including originality, production value (animation, set design, cinematography, sound, etc. ), story, and creative interpretation of the theme. Films will be discussed an ranked by the judges until a consensus is reached. The top three films will be eligible for the prize pool. Entries below 10th place will not be publicly ranked. There is one change this year. If your film requires, you do not have to include the mod element for up to 15 seconds of animation. This new rule is to allow for close-ups or shots where it may be difficult to incorporate the mod element. Additionally, we want to reduce the amount of reshooting or disqualifications if you should forget to include the mod element in a few shots. Once you have reached the 15 second maximum, be sure to include the mod element in every remaining shot of your entry. Aside from the new mod element rule, everything will operate the same as previous years. If you have any comments or questions, please feel free to contribute to the discussion below! Re: THAC XVI - Coming January 2019! I really like the addition of the 15 second leeway for mod elements. What is MOD exactly? The contest theme? Secondly, as I would like to animate using a 3D program (blender), how much of an asset may be created before it’s considered too much? For instance, I can go to a library and download LEGO bricks, without having to model them. I still have to clean the mesh up, add color, animate and render. Where or when in this timeline can I start early if at all? If I have a mini figure all set to go, and the contest theme just happens to match, is it usable in the contest, even though it was created before the start date? Lastly (2.999) can rendering farms be used for rendering a project? Just one film takes hours to animate, but it takes as much as 30 minutes to render just one frame of say a 12 FPS film. This means it could take 6 hours to render just 1 second of final film! Aw yeah, THAC is back! A Mod element is generally a color combination of bricks or a letter that the animator puts in each shot of the film so prove the video was made on THAC day. The contest theme will be announced on THAC day (January 5th). As for the CGI question.... unfortunately, this is a stop-motion contest, per the rules. CGI can be used to aid in the animation, but not be the primary focus unfortunately. Great improvement to add the 15 secs of non mod material! Will definitely reduce complexity, increase freedom of shots and lower the threshold to participate. Curious how this will work out, but confident it will lead to more participants. Booked the weekend... so.. I will definitely give it a shot!! Although I was initially excited by the endeavor, I have since gathered a more lukewarm reaction to this change. Because the mod element has to be present in every shot, and not every frame, what's stopping an animator from filming with the mod element in only one frame per shot... and then tossing in 15 seconds of previously shot footage? Or submitting a 30 second film with the mod element only present in half? Or using a bunch of jump-cutty shots that add up to 15 seconds overall without the mod? I doubt anyone would purposely cheat like that, but it is something to consider. And, depending on how it goes down this year, we'll see if the addition returns for THAC XVII, permanently, or not at all. It will, undoubtedly, give a bit more creative freedom however - especially under such a brief deadline; 24 hours. Shame. Is there any contests that will take cgi into account as an acceptable art form? It is kinda the future is many ways. Stop motion animation is the main focus on Bricks in Motion–especially for THAC as creating a CGI brickfilm wouldn't be doable in the contest timeframe. Also, primarily CG brickfilms have always been disallowed in THAC over the concern that someone could just spend as much time as they like creating a film, and then just digitally add in the mod elements once they are announced. You are seriously overestimating how much effort THAC entrants put toward cheating. Over the four years I hosted THAC, not a SINGLE entrant was disqualified for attempting to cheat - because no one did. The only disqualifications were from people who man genuine mistakes - and 90% of those were submitting too late. And those who were disqualified would have not been in the running for top 3 anyway, based upon quality and adherence to theme. I appreciate your enthusiasm, but we primarily focus on stop motion animation here. If community members would like to organize a CGI contest at some point in the future that's great, but official contests will remain stop motion based. About the new mod element rule: We've decided to add this rule for two reasons. One, to allow more freedom in your shot choices; close ups for example. And two, to save you time if you forget to include the mod element in a shot or two. In the past, I know I've had to go back and re-film something because I forgot the mod element. We want to avoid disqualifying someone for forgetting the mod element in a shot but creating an otherwise perfectly acceptable film. Awesomeness! I am thrilled to be able to say I am free on the 5th and 6th and shall be able to participate Let's do this! We've decided to add this rule for two reasons. One, to allow more freedom in your shot choices; close ups for example... We want to avoid disqualifying someone for forgetting the mod element in a shot but creating an otherwise perfectly acceptable film. I thought that the previous exception to the mod rule already handled this issue nicely. For particular shots where including the mod element would be disruptive to your artistic vision (such as extreme close-ups and shots with very low depth of field), you may include a legal mod element in the shot and then crop the mod element out in post-production. You then must provide an uncropped frame from that shot and explain in detail the cropped shot in the submission email. You will have to provide separate proof for each shot. So, correct me if I'm wrong - my entry could be completely devoid of the mod element as long as I provided uncropped examples for all but 15 seconds of animation. Providing an uncropped frame is no longer part of the THAC rules–it has been replaced by the 15 second rule. Outside of the 15 seconds, you'll need to include the mod element in every shot.